Hingham, MA - Phase Zero Design, a national architecture, interior design and planning services firm, is pleased to announce completion of Crack’d Kitchen. Crack'd is a culinary driven, gourmet fast-casual eatery concept that was inspired by the love of the breakfast sandwich. The 1,700 square foot flagship location at 319 Lowell Street, Andover, MA, is the first location in a series of a New England roll-out. 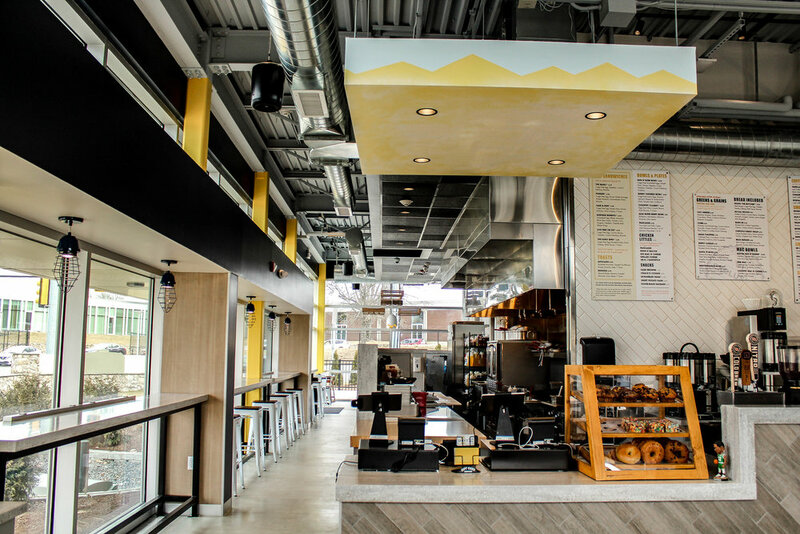 The main design focus was to create a highly functional space for employee workflow and customers who are eating in or picking up, while incorporating an egg and breakfast theme. The design was centered around the idea that excellence needs to be achieved at all levels of the customer experience. In order to do this, the enhanced dine-in and take out guest experience is enabled by technology and supported by an efficient design to keep up with high volume and production demand. Featuring freshly made breakfast, salads and grain bowls, craft sandwiches, smoothies and a state-of-the-art coffee brewing system, the menu is innovative and comfortable. You can visit Crack’d at their inaugural location Monday - Friday: 6:30am-8pm, Saturday: 7am-3pm and Sunday: 7am-2pm.